Here at Megaventory we are going through some of our most productive months ever. The recent developments have changed the face of our application and have introduced significant speed and productivity improvements. Back in November, we launched our latest major release: Megaventory 3.0. It is the biggest update we have ever released and we literally left nothing untouched. The new Megaventory is a responsive HTML5 web application that works perfectly from any device and screen size. It is now possible to perform actions such as closing a sale on the go using a tablet or a smartphone, further leveraging the advantages of a cloud technology. The app is now a lot faster too, since we have changed the technology and it is now based on a one-page application approach were a lot of the information is pre-loaded on the user’s browser. It features new, dynamic dashboards that boost productivity and cooperation among team members. For example, a user can create a shortcut to a pre-filtered list of open Purchase Orders and share it with his colleagues. Of course we worked in other areas as well: in the last couple of months, we have silently pushed more than 10 updates to Megaventory. The first few weeks we had to polish the initial release with speed and stability improvements and minor bug fixes. This made us more confident about the new release and we are now ready to speed up the transition process and of course to add new features. Firstly, we completely revamped the search module. Now, it not only allows the users to check the availability of a product in their inventory but they can also search for clients, orders or documents and even act on the search results. 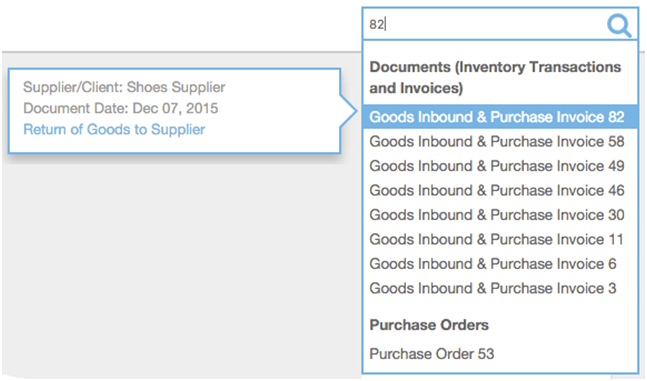 It is also now possible to issue a return document with a single click or get the order history of a client in no-time. The on-boarding process for new users was also optimized. For this reason, we designed new interactive walkthroughs that had a very positive reception from prospective Megaventory users. All the basic processes such as document and order creation, checking the stock levels or simply understanding the layout of the application are now handled by interactive step by step guides. This feature should also help administrator users of existing accounts to add more users to their teams. · making our On-Hand Inventory and Alerts module easier to read and understand. Overall it’s been a very productive period and we’re looking forward to the following months when we’re due to announce new improvements and a brand new integration! Stay tuned!